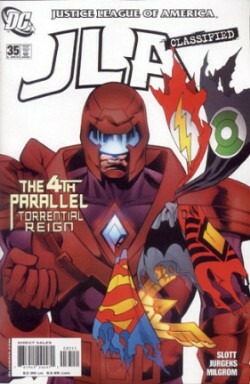 "The 4th Parallel" - Part 2C: "Torrential Reign"
The third scenario Darrin Profitt explores in his plans to destroy the Justice League begins by using his powers as the Red King to cause an asteroid to slam into Keystone and Central City. The blast kills Batman and Plastic Man instantly and the Red King uses the confusion to inject Superman with a mysterious virus before transporting the rest of the League to various points on the globe. The Flash is the first to reach him, but the Red King was prepared for this and hits the Scarlet Speedster with a blast of energy. He attacks Wonder Woman next with the Flash running to help but discovering that the energy negated the aura that surrounds his body to protect him from heat friction when he runs. The Flash is too late to save Wonder Woman whom the Red King kills. He supposedly kills John Stewart in New York and after battling members of the Justice Society and Booster Gold he travels to Metropolis. Red King calls Superman out and despite being infect with the Bizarro virus the Man of Steel answers the challenge. Despite a last ditch effort on the part of the Flash, Green Lantern, the infected Superman and the Martian Manhunter the Red King triumphs at the cost of the world around him. Story - 5: So we've seen the Red King seduce the League into accepting him and we've seen him make a blunder and destroy the planet. The one thing we haven't seen is the King taking on the League directly, power versus power. I've long been of the opinion that a story which is resolved by a character traveling back in time to make sure nothing that had come to pass would come to pass is pretty weak storytelling. It was my only major problem with John Byrne's GENERATIONS III and the biggest beef I had with Donner's cut of SUPEREMAN II. It just seems like a cop out and a cheat to the readers. The writer gets to tell a story where all kinds of shocking things happen with absolutely no consequences to the characters involved because in the end it "never really happened". I realize this is a personal problem because there are times when I put too much thought into the ramifications of the stories I read, but it's how I feel just the same. So why do I like this story so much and have no problem with the overall concept? Because the point of the past three issues was to show the Red King going through three different scenarios on how to "destroy the Justice League" in an effort to figure out the best way to get the League out of the way of his personal plans for world conquest. The whole point of the past three chapters was to run a living computer model on how to achieve his ultimate goal so the fact that even though the stories had no real consequences it didn't matter because that wasn't the point. We were given a heads up right at the outset so I could appreciate the stories for what they were and not feel cheated at the end. This final scenario was by far the most disturbing. The Red King was brutal but at the same time he was pretty clever in his methods of taking out the League. The Bizarro Virus (which is something I would like to see come into the Superman books at some point), removing the aura that protects Wally, distracting Green Lantern with horrific images to lower his will power, killing Batman first, etc. All of these add up to a well thought out attack that accomplished his goal. The only problem is that he also did a good job of wrecking the planet he wanted to conquer. So while it was great on paper the execution needed some working on. This is the point of running though realities like pages out of a sketch book I guess. The narration was particularly strong this issue. It was interesting to see the events unfold through the eyes of a minion and I think this went a long way to giving this chapter an emotional center. It was also somewhat amusing as well in places but only in how the narration was worded. So overall this was another great issue with an appearance by Emil Hamilton to boot. I'm looking forward to the next issue to see how this wraps up. Art - 5: The art was once again really solid. It's still a kick to see Dan Jurgens working on this book with finishes by the very talented Al Milgrom. It's great to see an industry veteran like Milgrom getting some exposure. As mentioned before this was a pretty brutal issue, which is something that I've rarely seen in Jurgens' work. Still he managed to make it shocking without going overboard, especially in the case of Wonder Woman and Wally. Wally was kind of interesting. It's difficult to top how rough Superman looked during his fight with Doomsday, but Jurgens managed to top it. And there was a brief cameo by Booster Gold, but considering Jurgens' involvement it was welcome and expected. Cover Art - 5: White background. Villain holding torn pieces of the heroes' uniforms looking big and bad. Yup, those are the main ingredients to a solid comic book cover. No complaints here.